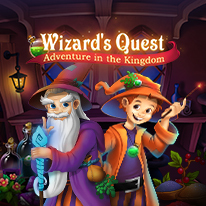 Save a Magic Kingdom after magical potion accidentally transforms the prince into a dragon. A distant kingdom is shaken to its foundations as one not quite mature potion accidentally transformed the prince into a dragon. Rebuilt the entire city and let its former glory shine again, reverse the transformation of the prince and restore the whole kingdom before the wedding day of the princess arrives. Overcome all obstacles, use power-ups, earn bonuses and trophies. A challenging match 3 game with adventure- and puzzle-game elements as well as bonus games await you.